In 1902, 1904 and 1907 subjects of this breed were exhibited at dog shows. In 1907 a few breeders of the region of Burgdorf decided to promote the pure breeding of this native dog by founding the "Schweizerische Dürrbach-Klub" and fixing the characteristic traits of the breed in a first standard. In 1910, at the invitation of the "Dürrbach-Klub", there were already 107 subjects shown by the farmers at this very special event. 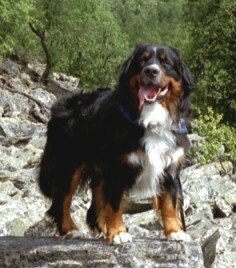 From that day onward this dog, renamed "Bernese Mountain Dog" (following the example of other breeds of Swiss Mountain Dogs) became rapidly known all over Switzerland and Southern Germany. Today the Bernese Mountain Dog is well known and appreciated all over the world as a companion and family dog thanks to its striking tricoloured coat and its great adaptability. N.B. Males should have two apparently normally developed testicles fully descended into the scrotum.